After a full redesign last year, the Armada returns for 2018 with relatively minor changes. NissanConnect is now standard across all model grades, as is a new USB charging port. A Platinum Reserve model is also new for 2018, which includes dark chrome exterior trim, a premium wood trimmed interior and 20-inch wheels. 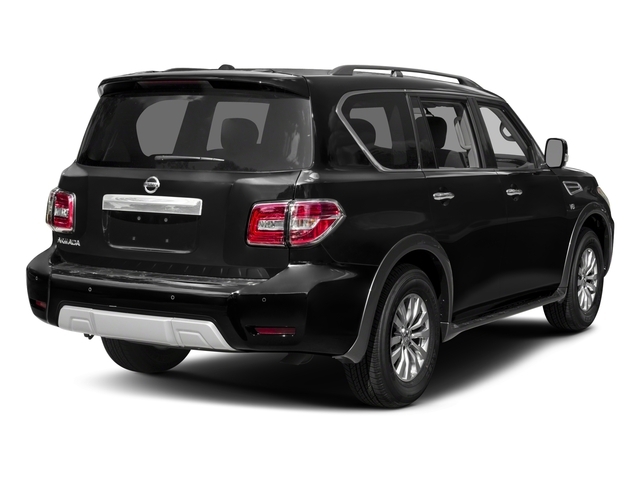 The Nissan Armada is a full-size, 8-passenger SUV that is available in either 2- or 4-wheel drive. It is offered in three trim levels: SV, SL, and Platinum. All are powered by a 32-valve, 5.6L V8 that makes a class-leading 390 horsepower and 394 lb-ft of torque. Power is put to either the rear wheels or to all four through a 7-speed automatic transmission. The pairing is good for 14 mpg in the city and 19 mpg on the highway in 2WD models. When properly equipped, the Armada can tow up to 8,500 pounds. Styling is in line with the rest of the Nissan lineup, with a V-motion front grille, LED headlights and daytime running lights. LED lighting also features in the rear, while exterior mirrors include "hospitality lighting," which activates puddle lights when the drive approaches. All Armadas feature rugged body-on-frame construction, with boxed ladder frame rails that are wider and stiffer than the previous Armada. Four-wheel independent suspension is found across the range, which lends the big SUV a smoother ride and better handling in everyday driving. Inside, Nissan has employed extensive sound deadening and acoustic glass, which results in a quiet ride. 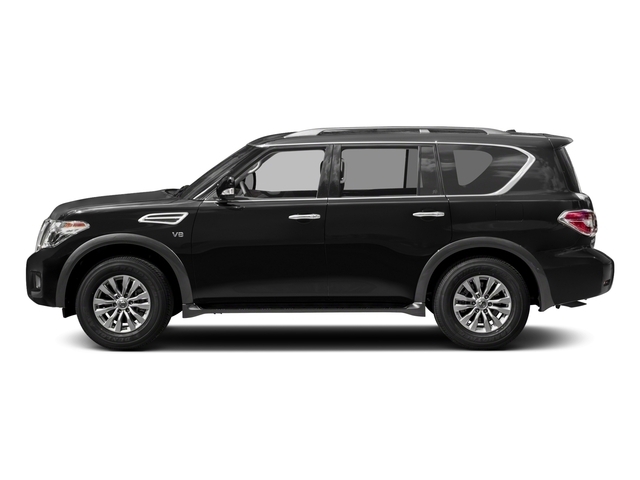 The Armada SV rides on 18-inch alloy wheels and includes automatic LED headlights, chromed grille and door handles, power folding mirrors with integrated turn signal indicators, a rearview camera and front and rear sonar for aid in navigating tight spots. Inside, navigation with voice recognition is standard, which is broadcast on an eight-inch touchscreen display. Other standard features include Bluetooth hands-free connectivity with audio streaming, dual-zone automatic climate control, power one-touch front windows, cruise control, and four 12-volt DC outlets. Heated cloth front seats are also standard, with 8-way power adjustability for the driver. The second- and third-row seats are 60/40 split-fold benches. Leather graces the steering wheel and shift knob, while wood-tone material is featured throughout the cabin. A 13-speaker Bose audio system provides the tunes. The Armada SL adds 20-inch wheels, fog lights, remote start, heated power mirrors, rain-sensing windshield wipers, and a power rear liftgate. Leather front seats with driver's side memory are also standard on the SL, along with a HomeLink universal transceiver, Around View Monitor with four cameras, 120-volt AC outlet and more. The Armada Platinum comes with all the SL's standard features, along with a power sliding moonroof, dual-zone automatic temperature control with a cabin filter, as well as a 3-zone entertainment system with dual 7-inch displays, DVD player with remote and two wireless headphones. Also standard are intelligent cruise control, heated and cooled front seats with heated second-row seats, heated steering wheel, and advanced safety technologies like backup collision intervention, lane departure warning, predictive forward collision mitigation and a blind spot monitor. Several packages are available for the Armada. For the SV, the Driver Package adds a power 60/40 third-row seat, auto-dimming rearview mirror, trailer towing harness and power liftgate. A Moonroof Package is available on the SL, as is a Technology Package, which brings intelligent cruise control, forward emergency braking, blind spot warning and other advanced safety features. 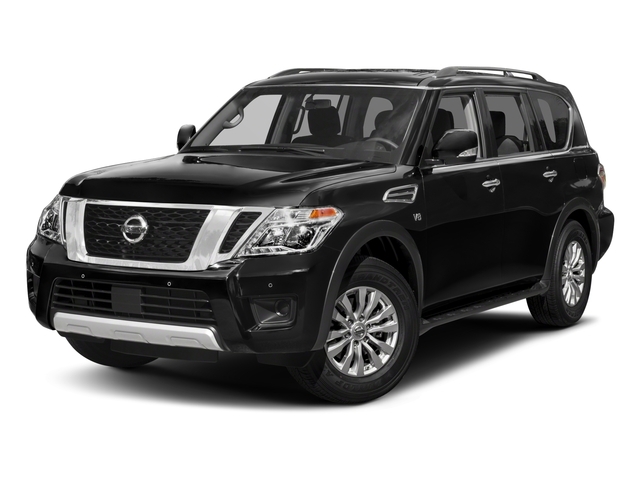 With its 390-horsepower V8, the Nissan Armada is a leader in the struggle for power among full-size SUVs. The engine allows for towing up to 8,500 pounds, all while carrying eight passengers in comfort. Against the likes of the GMC Yukon and Chevrolet Tahoe, the Armada's refinement stands apart, and with several advanced technology and safety features available, buyers can configure their Armada to suit their needs.